The Chronicle is on location to bring you all the news from one of the most historic shows in the country. Don't miss updates about the Grand Prix de Penn National CSI-W, Pessoa/USEF Medal Finals, Randolph College Prix des States championship, and all the top hunters. “Every year I’m hacking around in the morning, and I look at the wall and go...” she trailed off with a shake of her head. Leslie Howard first showed in the Grand Prix de Penn National in 1979, and she's finally won it. “She’s just come along so quickly, and she’s easy. She’s the easiest horse I’ve ever ridden." Today's amateur-owner winners are no strangers to championships at the Pennsylvania National, and they've both returned with very special horses. “It was a little bit of love at first sight." 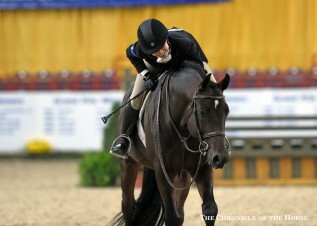 Lisa Arena Davis gets her first Pennsylvania National Horse Show tricolor aboard a very special horse. “He’s just been simply outstanding." Conor Swail does it again. That can't be good! Reid Patton shows off the three buckles that broke off her girth during today's amateur-owner jumper class at Harrisburg. Scott Stewart isn't surprised often, but he was pleasantly surprised to find himself collecting the grand champion honors with Lucador today at the Pennsylvania National. When it comes to young horses, there's no guarantee, but Peter Pletcher finessed his way to the top of both pre-green divisions. "He gave me 150 percent both times. I couldn’t have asked him to be any better.” The first professional division championships were awarded today at the Pennsylvania National. Let's take a look back at videos from the top rounds from yesterday's Pessoa/USEF Medal Finals. “She went early in the class, and we couldn’t stop thinking about it the whole class." First impressions can be important—and from the start Kelli Cruciotti proved she was going for the win. Can't watch the live stream or missed someone you wanted to watch? We're here in Harrisburg, Pa., for the Pessoa/USEF Medal Finals and will be bringing you the action from inside the Farm Show Complex.